There are many great ways to support Gunston Middle School’s PTA – and they are all quick and easy! Thank you for contributing to the success of our school by contributing to the PTA! It’s time for collecting Boxtops for Education again. The collection box is in the hallway by the main office. You don’t have to worry about cutting them neatly off the boxes and bags, but do make sure the expiration date shows (and that it is still valid). The Gunston PTA needs your support for our annual “Armchair Fundraiser.” This is a great way for busy parents to offer greatly needed financial support without having to purchase anything! EVERY penny we raise will enhance your child’s school experience. The Armchair Fundraiser is easy to take part in and requires little time or effort. All we ask is that you provide a tax- deductible donation to the Gunston PTA! Please fill out this form and send in your donation. Cartridges for Kids will give Gunston PTA cash for returning toner and inkjet cartridges for recycling. Other electronics such as laptops, iPods, PDAs, video games &consoles, digital cameras, DVDs and GPS devices can also be recycled for cash! The website http://www.cartridgesforkids.com describes the program and includes a list of eligible items. Place items to be recycled in the box marked Cartridges for Kids in the library by the water fountain. Please ask friends and family to send in their cartridges too. If you can’t figure out if it is recyclable, don’t worry. Bring it in, marked with your name and phone number. We will check if it is on the “accepted” list and let you know for future reference. Please do not leave damaged cartridges. They are not eligible for recycling and they make a big mess when the toner or ink leaks out! Do you know a business that would be able to participate? Business partners can recycle and help the school at the same time. If you know an office, firm or agency that would like to participate, please contact us and we will set up a system for collecting and sending the cartridges. 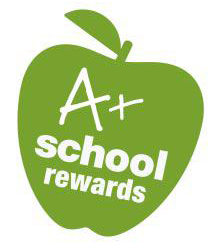 Please participate in the Giant A+ School Rewards program, which will earn Gunston’s PTA cash for your purchases.You can support up to three local schools. Every year, you must re-register your card and re-designate that funds go to Gunston, even if you participated last year. The Gunston school code for Giant is 03029. Use your Bonus Card number to register online. Gunston also belongs to the Harris Teeter Together in Education (TIE) program to earn more to help our kids. Link your card online. You need to do this at the beginning of each school year. You can support up to five local schools. Ask friends and family to link their cards and support Gunston too!